Prize boxes always drove me CRAZY! I hated spending a ton of money on silly things that would loose its value in no time. I have to admit, I had a prize box for years even though I hated it. I want to reward my students, but didn’t know any other way of doing it. This year I got rid of the dreaded prize box and I’m so glad I did! It annoyed me that once a student would get a prize, they would enjoy it for a second and the excitement would fade. I wanted to use something that kept my students motivated to keep working hard and continue to make smart choices. After spending a lot of time thinking of ways I could replace the dreaded prize box, I decided to create Reward Coupons. I wanted something that was meaningful and would motivate everyone. I created 60 coupons, it took me FOREVER to come up with 60, but I wanted to have a variety to pick and choose from. I’ve been using these coupons since September and it has been amazing! I’ve never had a class that has worked so hard academically and behaviorally. Students receive their coupon for a variety of things, taking a risk in class, doing the right thing when others are not, never missing homework, improving a test grade, the opportunities to receive one are endless! 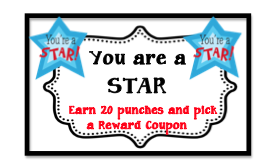 Due to the variety of Reward Coupons I am always able to find the perfect coupon to praise my students. It’s hysterical to see how excited a student gets when I tell them they earned a reward coupon! The best part about the coupons is that I don’t have to buy a thing!! I also love these coupons because other students see the privileges you get when you work hard and make smart choices. I love your reward coupons! I'm currently a kindergarten teacher and my co-teacher and I use the "treasure box" idea....but I've never been the biggest fan on it! This is such a great idea and would work great for positive reinforcement. Thanks for the idea! I'm your newest follower! I just started a blog, if you have time you'll have to come check it out! I just found your blog...very cute! I have a reward coupon freebie at TPT. I love offering both to the kids and they usually pick the coupons. I will be sure to pop in more often. This is an awesome idea that I will use next year! Thanks so much for sharing! In conjunction with Class Dojo, hopefully my students will see that good choices will bring rewards.